Stuff Week Three - "The Worst Thing Jesus Ever Said"
This week I am continuing the sermon series, "Stuff: Are the Things We Buy Killing Christmas?" Over the course of the last two weeks we have determined that we have a problem with stuff, and that we need to get rid of our stuff. 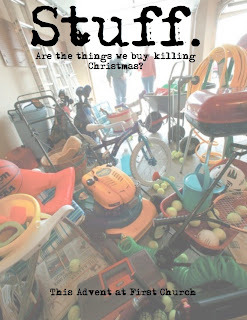 Stuff, it seems, is getting in the way of our truly celebrating Christmas with Christ at it's very center. For the past two weeks my family and I have been practicing "The Big Giveaway" during this season of Advent. We have given away 5 things a day since December 1st. If you do the math, by Sunday we will have given away 55 items a piece. There are four of us, so (55 times 4, carry the one, subtract something) that means that we piled up 220 items. The truth of the matter is that there will be more than 220 items on the pile that I am planning on bringing to church on Sunday. Because I discovered that I had way more stuff than I thought and while I was sorting through items, I decided to give a little extra. It doesn't make me a better person---trust me on this---it just means that I had too much stuff. No matter what we say we believe, most of us who call ourselves Christians are going right along with our culture in placing the emphasis on this blessed season on all the wrong things. Which brings us to this week's topic: "The Worst Thing Jesus Ever Said." What do you think the worst thing Jesus ever said might have been? When he called Samaritans dogs? When he said that not everyone who called him "Lord" would be saved? It sort of depends on your point of view, right? If you were a Samaritan, that bit about being called a dog by the Son of God would not be too warm and fuzzy. Or if you were one of those who called Jesus "Lord" and discovered that you didn't really "get" it in the end... yeah, that would also be a bummer. So, what's your point of view? What is your location right this second? You could probably add a bunch of other descriptors to that, but you get the idea. Sometimes our point of view holds a lot of influence over what we see, perceive and even how we hear things. Which is why this passage of Scripture in Luke might just be the worst thing that most of us who call ourselves Christians AND Americans could ever hear from our Lord and Savior. This is the story of the "Rich Young Ruler" Which most of us know just because it contains the worst thing Jesus ever said---for those of us who have a lot of stuff, that is. In verse 18 the rich young man approaches Jesus and calls him "good teacher." Jesus replies that there is "none good, but God." What Jesus wants the young man to know is that he cannot be flattered. He also wants him to know that he is going to shoot straight with him. The young man wants Jesus to let him know how he can be sure that he will have eternal life. Jesus replies by telling him in verse 20 that he basically just needs to keep the Commandments, which the young man claims that he is already doing. He's confident that he can make it on his own merit, in other words. Some might say that Jesus' response to the young man is problematic--he seems to be espousing that the way to salvation is through keeping the rules. But Jesus next words give us a deeper understanding of what Jesus is getting at here. In verse 22, he tells the young man, "You still lack one thing..."
It's almost like Jesus let the guy think he had it made, and then hits him with this little "one more thing," hand grenade. And the "one more thing" was that Jesus wanted the guy to give away all of his stuff and come follow him. There have been countless debates about whether Jesus actually meant this. I think he did. I think that he knew the young man had been going through the motions, depending on his own strength and put all of his faith and trust in his wealth and stuff. Clearly, Jesus wanted him to understand that when it comes to eternal life, it's not about the rules, it's about a relationship. And if your relationship with God is right, things like losing all your stuff doesn't scare you. We all know that the young man went away sad, because he had great wealth. But most of us stop there and don't keep reading. In vs. 23-24 Jesus has a teaching moment with his disciples about the whole thing. He tells them, "How hard it is for a rich man to enter the kingdom of God...It is easier for a camel to go through the eye of a needle for a rich man to enter the kingdom of God." Lots of commentaries interpret Jesus' words here as a description of the "Needles Eye Gate" in Jerusalem. I don't think that's the case. I think he literally means the eye of a needle. When we consider that compared to almost everyone else in the world, even the poorest Americans would be considered "rich" it sort of makes you pause. It made the disciples pause a tad. "Who then can be saved?" they asked. Jesus goes on to tell his disciples that what is impossible for human beings is possible for God. There is another moment when Jesus is teaching that he does use the metaphor of gates and riches---although most Christians seem to interpret it as something altogether different. In Matthew 7:13-14 we have this: "Enter through the narrow gate. For wide is the gate and broad is the road that leads to destruction and many enter through it. But small is the gate and narrow the road that leads to life, and only a few find it." The larger gate could be opened wide to allow many people to walk through at a time. But when it was shut, and the smaller gate was open, only one person could enter at a time and if you had a bunch of stuff with you, or a donkey with a bunch of stuff strapped to it, you would not make it. 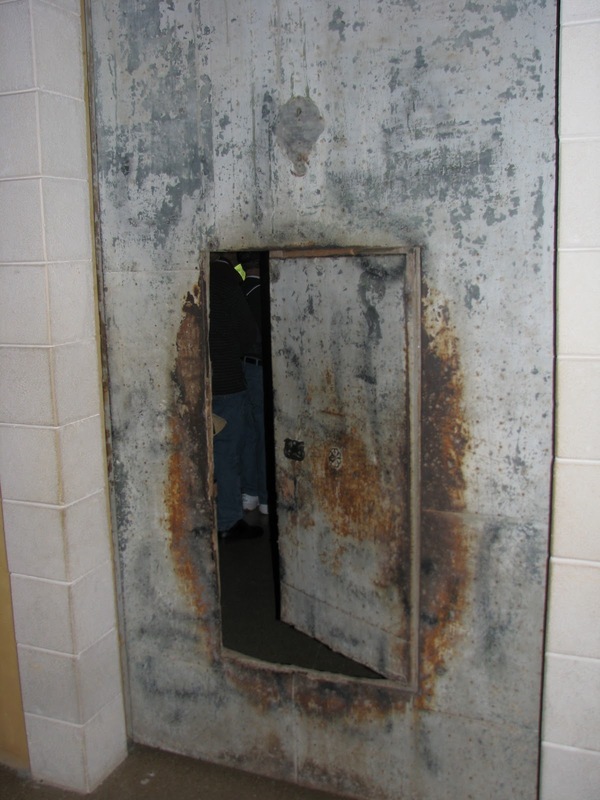 Could Jesus have been referring to this kind of gate when he was teaching? I think he was. The way to destruction, he seems to be saying, is one that is easily accesible on your own terms. The way to life is one in which you leave behind all of the things that you think will save you and just simply follow Jesus. If your stuff, in other words, is keeping you from following Jesus, maybe your stuff needs to go. I think that for those of us comfortable Christians here in America, hearing Jesus say that we need to give away our stuff and follow him qualifies as the worst thing he ever said. 1. He was obsessed with keeping up appearances. It was important to him that he do the right things and be recognized as such. I call this kind of Christian a CINO--Christian In Name Only. This kind of person looks like a Christian, but there isn't any real evidence of it outside of church world. 2. He depended on his individual strength. The young man wanted some validation that he was doing what he needed to do in order to get into heaven. When Jesus initially offered that affirmation, the young man was content. "Ah," he thinks to himself, "I've got it under control. I knew it!" Most of us simply want affirmation that what we are doing in terms of our Christian life is a-ok.
3. He had a fear of not having enough. The young man was unable to do as Jesus asked, because his wealth was what defined him. He had safety, security and a future because of his wealth. He was afraid of what would happen if he did not have enough. So many Christians fall into this trap---worrying that if they truly let go of the things that are keeping them from drawing closer to Christ that they will have to change the way they live. 4. He lacked a real relationship with God. In the end, the young man revealed that his relationship with God was defined on his terms. It verified and affirmed his world view. He kept up appearances, worked hard and did everything "right" and then God blessed him with stuff. So many Christians find themselves doing the very same thing---seeing their stuff as blessings for a life well lived. Or the absence of stuff as an indictment of how they aren't living "right." God doesn't deal in commodities. God's currency is unconditional love, generosity beyond belief and grace beyond measure to people who don't deserve it. So... Do you rule your Stuff, or does your Stuff rule you? Be careful how you answer that. Because if you say, "I rule my stuff, man, and not the other way around," you'll have no problem letting it go, right? You'll have no worries about losing it all, right? Right? What we participate in more than what we say reveals the heart of our worship.